Flow Free is a puzzle game. You must build many color pipes at many different points and spread around the lattice, with the aim of filling the lattice. At the beginning of each level there are many different color points placed around the lattice. Your goal is to connect together to form many pipelines without overlapping each other. In total, Flow Free has more than a thousand levels that you can play. Your goal is to complete each level with as little motion as possible. In addition, you can also play against the clock for something more difficult. Talking about appearance, besides being very easy, Flow Free is also very interesting thanks to the different color pipes. 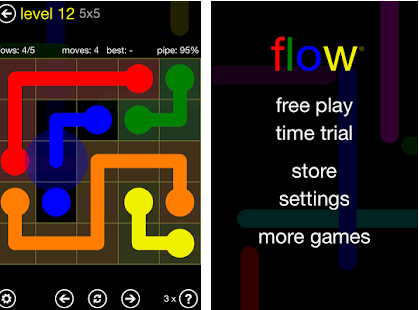 Flow Free is a puzzle game with a very simple mechanism but provides exciting and exciting challenges. You will continue to play for hours.